Growing up in a rural setting I was privileged with the ability to study the natural world around me. Unlike others, I had an artistic fire that periodically erupted first with pencil then spread to other mediums. Subject matter varied but firmly entrenched in the natural world. Producing several pieces of art during my life, I failed to recognize them as a reflection of the uncultivated talent within me and therefore did not pursue formal training until 2010. Having been diagnosed with Parkinson’s in 2005 I continued to work as a technical writer until my symptoms forced me into retirement in July of 2009; I was 62 years old. It is said that things emerge when the time is right, when a person is ready to receive and respond. For me it was December of 2009 when I parked in front of an Art Gallery in Southern Pines, North Carolina. Naturally drawn to art, I surveyed the artwork displayed in the gallery’s window. I was immediately attracted to the artist’s style and entered the studio to view other offerings. I discovered that the paintings were the work of gallery owner and before leaving I signed up for six weeks of oil painting lessons, which would begin in January of 2010. Over the past five years I dedicated every available hour to honing the technical skills necessary to produce quality paintings. Incorporating detail into my work defines my artistic style as “realism”. I believe that inclusion of details produces a close duplication of the subject, which enables me to incorporate emotion within the painting, which is felt by the viewer. If the painting fails to accomplish this task, then the piece is but canvas covered with paint. As my Parkinson’s slowly progresses my “realism” style has been evolving towards an impressionistic – realism, which demands less detail and more freedom of movement. 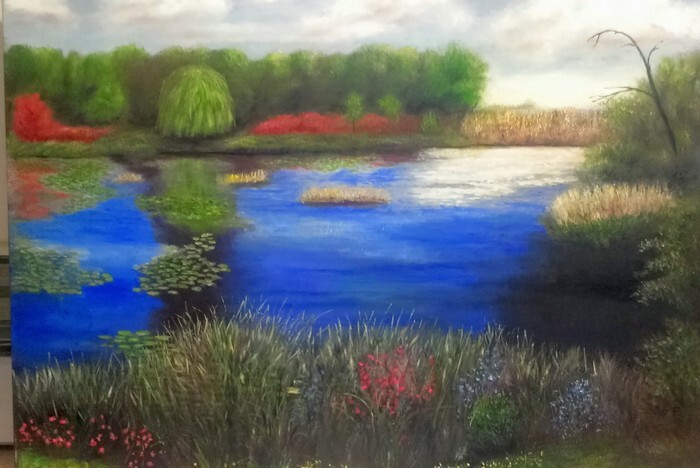 Although my work is usually a mixture of realism and impressionism, with a focus on nature and landscapes. Occasionally an abstract painting springs forth. I strive to insert emotion into each painting hoping to transfer them to viewers. 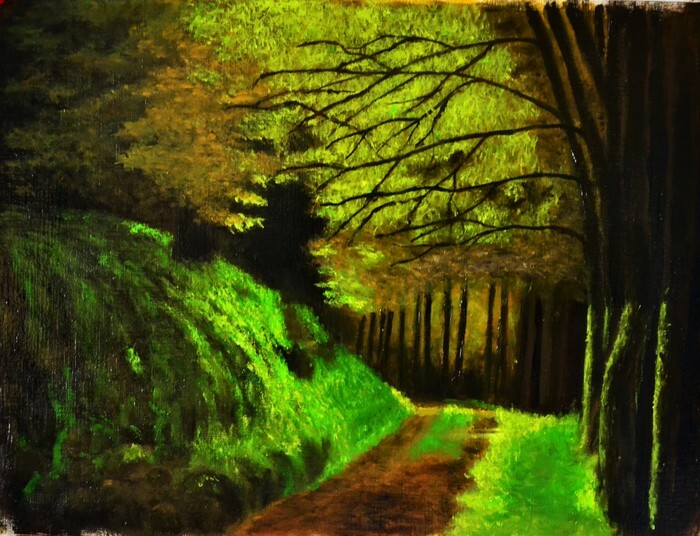 An old image inspired me to paint this radiation of an old dirt road cut through a side of a forested hill. The sun passing through the leaves of the trees brought a patch of ground vines to life. Florida sunsets offer spectacular, often breathtaking encounters as the sun fades into the Gulf of Mexico. Mystic Sunset catches the dramatic, yet beautiful convergence of a colorful setting sun as black clouds of a late summer's storm begins to encrouch. This 24x32 oil on cardboard is available at the reasonable price of $ 1200 framed and gallery inquires are welcomed. Painted from a photo taken by my brother, I was taken in by the complexity of composition as well as the collage of colors offered. 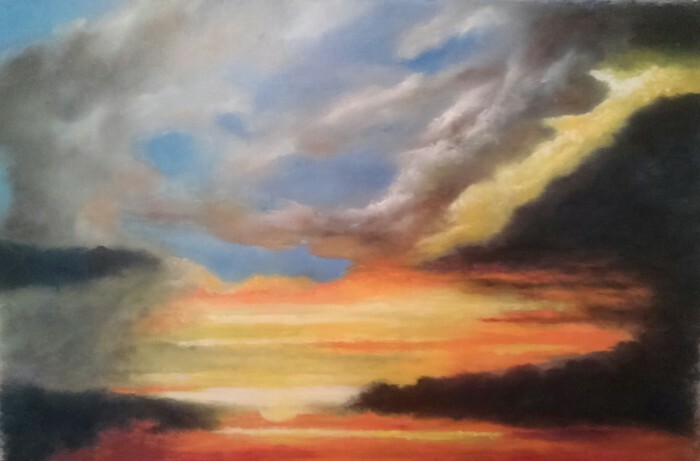 This 36x48 inch oil on canvas comes ready to hang at $2400; shipping is not included. 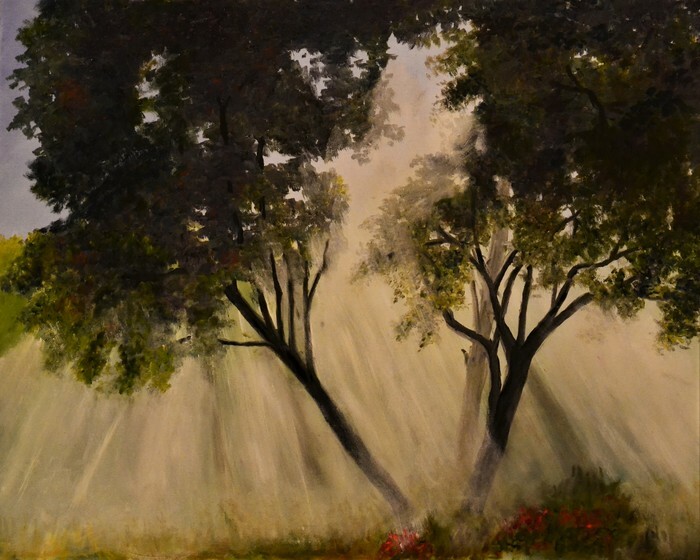 I used layers of glazing to achieve the effect of sunlight filtering through trees igniting the morning mist. The work is oil on a 24x30 inch canvas. 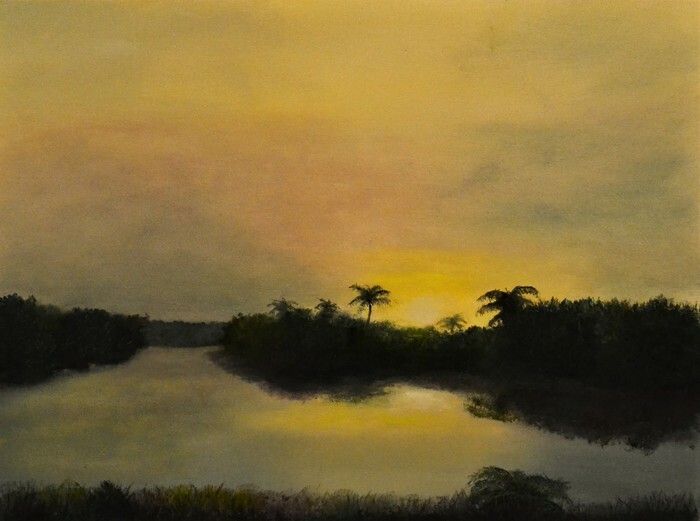 This oil on 24x30 inch canvas catches the peacefulness of the everglades at the beginning of a new day. 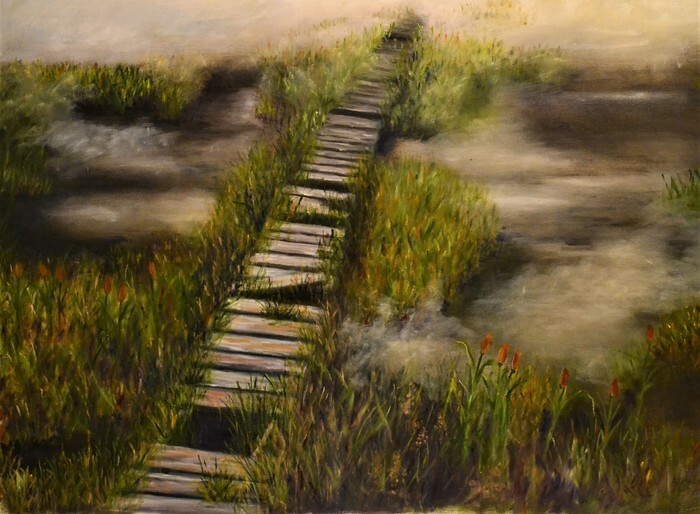 Oil on 24x30 inch canvas depicts life from what was a new dock leading to a purpose but with age it shows the wear of the years as it fades into the fog of uncertainty. This work was selected as a finalist out of over 2,000 entries in Art Design Consultant's contest "Art Comes Alive". Dabbling in various art mediums has been part of my life for 71 years. My creativity surfaced from time to time and then go dormant. However, this changed in 2005 when I was diagnosed with Parkinson's. After painting almost daily for twelve years I decided to share my work with others in hopes of selling some of my paintings and donate 20% to either the National Parkinson's Foundation or the Michael J Fox Foundation to help find a cure for this hideous disease.